We are a chaat loving family. Paani puri, Chaat papdi or Aaloo tikki – we bring street food home. 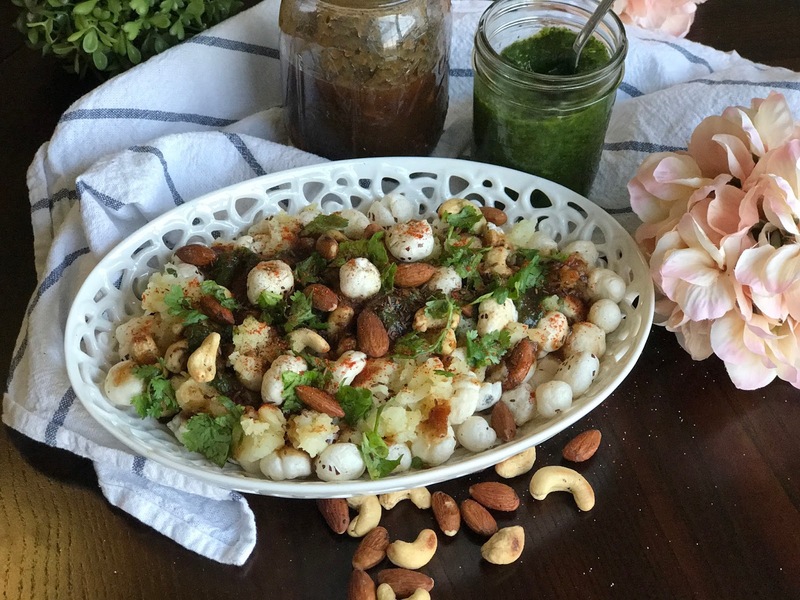 I always keep green chutney (cilantro/mint) and khatti-meethi chutney (tamarind) ready, so whenever chaat craving strikes I am armed to dish out a yummy chaat. Yesterday while roasting makhane, mom recalled eating makhane ki chaat at a wedding in India. She could not stop raving about it. I also liked the idea and we made it right away. Try it and it will soon become your favorite. Crunchy makhane and roasted nuts combined with spicy chutneys and grated potatoes taste so delicious that you would not stop eating. It is also a very good recipe if you are fasting and bored of the usual ‘Vrat ka khana’. Here’s the recipe. The proportions are not precise and you can vary them to your liking. Sprinkle spices, yogurt and chutneys as per your liking and top it with finely chopped cilantro, eat it right away, you don’t want the makhaane to turn soggy!! If we use oil/ ghee for roasting makhane, how can we call it dry roast? You are right, I meant minimal oil/ ghee! !